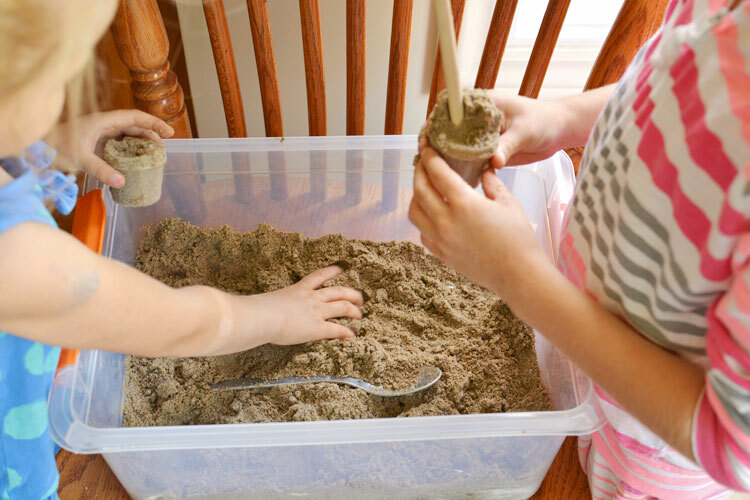 This moldable play sand recipe is the second kinetic sand recipe we tried and it turned out really well! It has a wonderful texture AND it doesn’t stick to your hands. (Which was awesome for everyone!) It’s completely moldable, and it seems like it’s wet, but it’s not! And the best part is that when you’re all done with it, you can put the lid back on the container and it will keep for months! 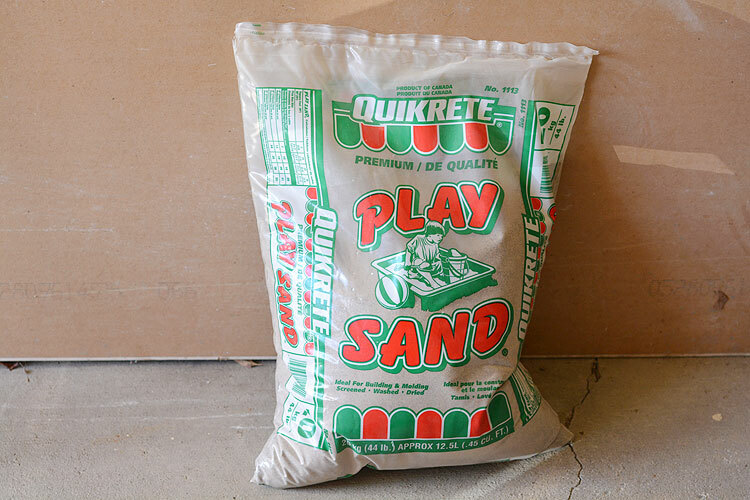 We bought a 44 lbs bag of play sand at Home Depot for about $5. It’s A LOT of sand. I’m not sure what we’ll do with it all, but I’m sure I’ll find something. 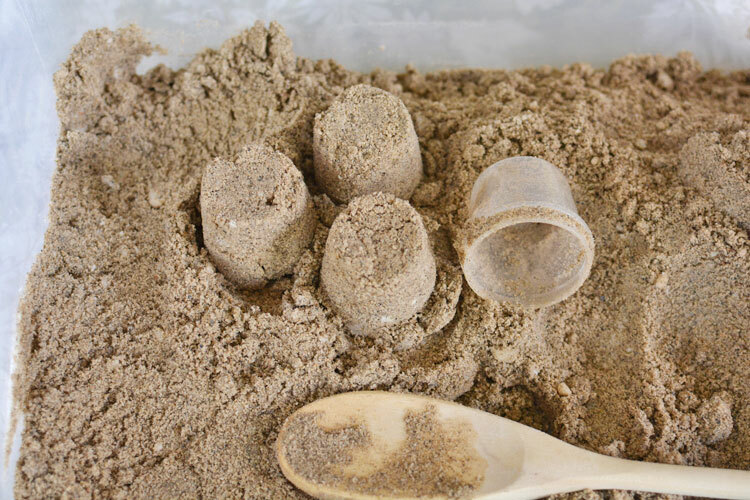 It worked perfectly for all of the kinetic sand recipes we’ve been trying! I was a little skeptical about adding flour and oil to the sand. I wasn’t sure what to expect with the combination, but to tell you the truth, it worked out really well! 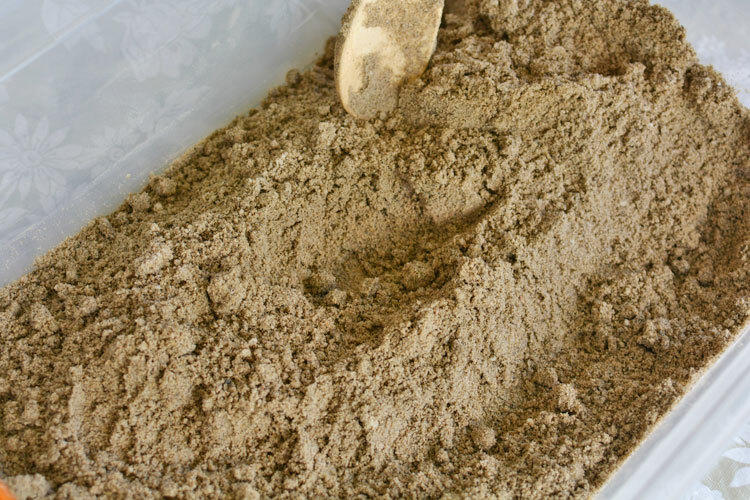 This play sand had a fantastic texture, was completely moldable, and it didn’t really stick to the skin. Other than my girls dropping bits and pieces on the floor (I don’t particularly recommend playing with this in a carpeted room! 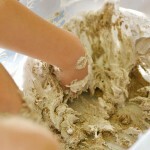 ), it was pretty clean, and much easier to get off the skin than the shaving cream foam sand we made. It’s really easy to make! 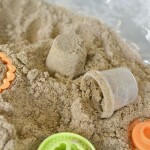 Combine 5 cups of play sand, 3 cups of all purpose flour and 1 cup of vegetable oil in a large container. That’s it! 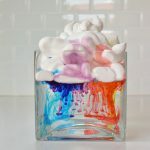 (The full printable recipe is at the bottom of this post). 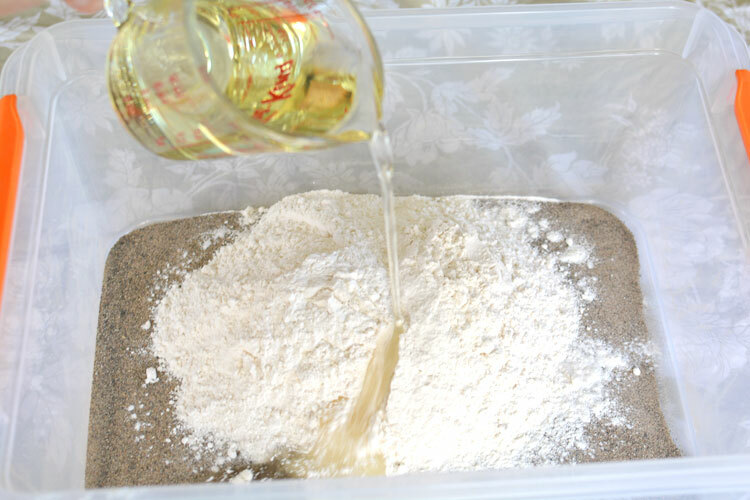 You can mix the flour and sand together first if you want, but it really didn’t make a difference. 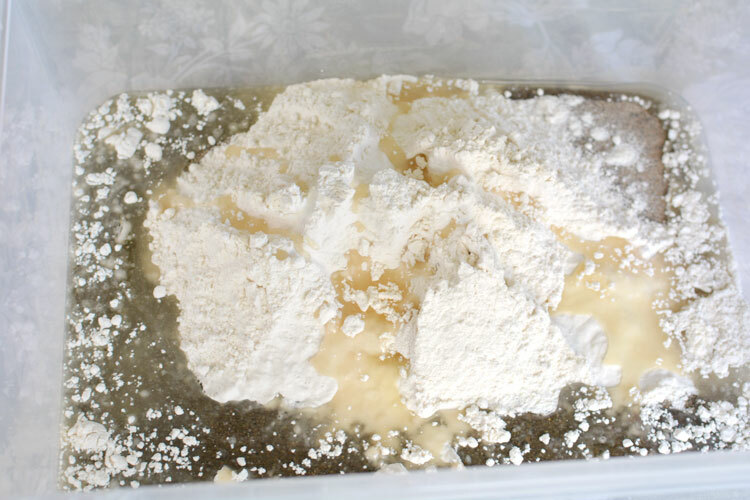 It ended up with a few flour clumps after we added the oil, but I was able to stir them out pretty easily. I actually really enjoyed the texture of this sand. It was much smoother than the shaving cream sand foam we made, probably because of the flour that was added? And it definitely has fewer chemicals and waaaaaaay less of a perfume smell. You can read all about that here. It was easy to mold it into little castles that held their shape. If it seems dry to you, just add more oil. Ours was a little bit crumbly, so I think next time I’ll increase the amount of oil to get it more doughy. Out of all of the recipes we tried, my kids played with this one for the longest amount of time. I think because it has a great texture without being extremely messy. 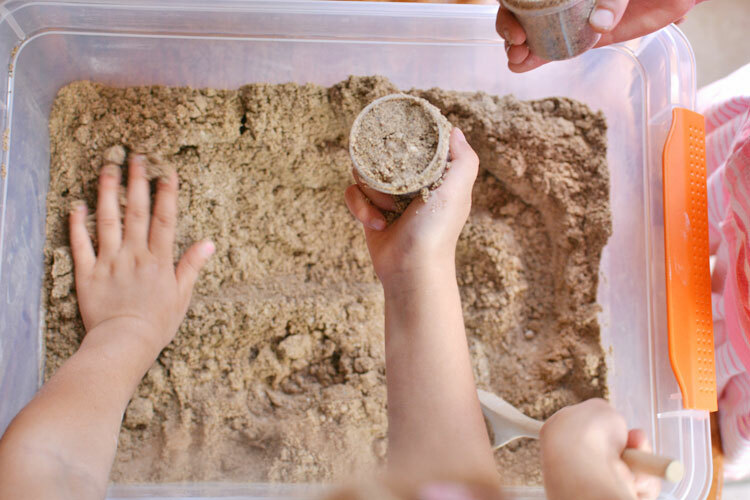 They are okay with getting their hands dirty, but it’s not much fun when you can’t move around anywhere else in the kitchen because you have caked on sand all over your hands. All they had to do was brush their hands together a few times and this stuff came right off with no mess. I also love that it won’t dry out! When you’re done playing with it, put the lid on and store it for another time. It should last for months and because it doesn’t have any water in it. Just take the lid off and you’ll be ready to go again. The last recipe I tried (which I’ll post about tomorrow) used water instead of oil so it dried out after a few hours. 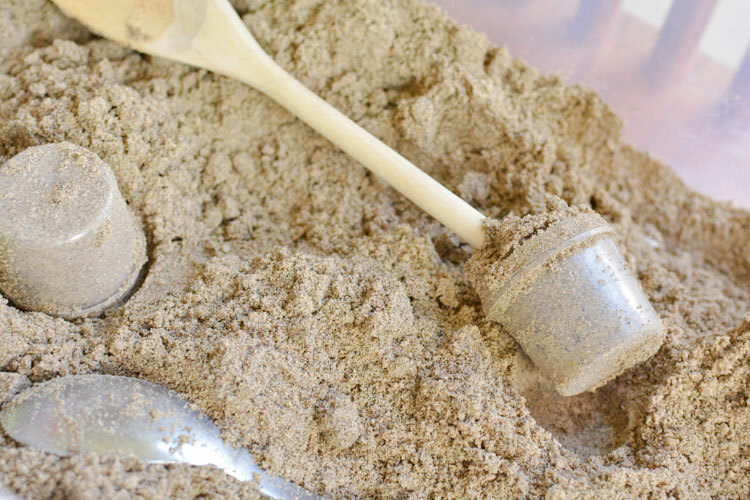 This moldable play sand recipe has just three ingredients! It has a great texture and it doesn’t stick to your hands, so it’s really easy to clean up! 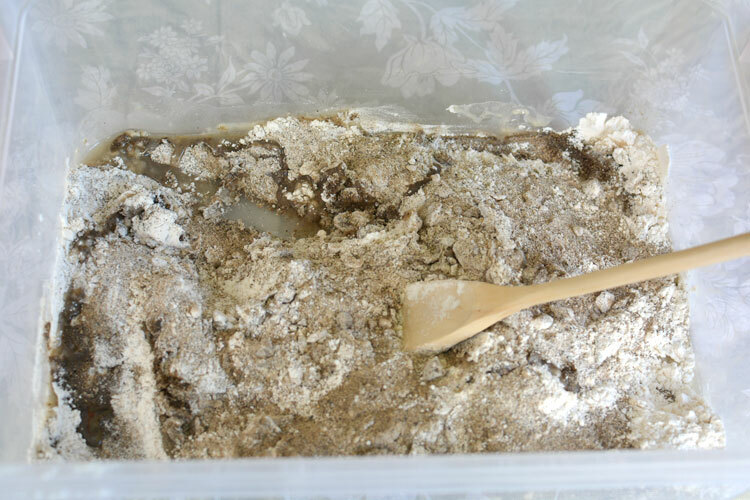 The kids had tons of fun molding it into shapes, squeezing it and stirring it around in the container. It’s really easy to make and will store in a covered container for months! Great recipes! 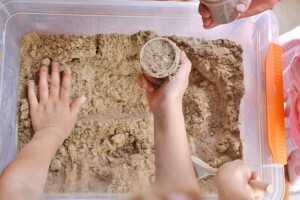 I can’t wait to make the moldable play sand. Thanks for sharing on the SHINE blog hop. 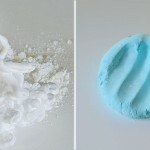 That moldable play sand looks pretty awesome! I’ll have to give that a try some time! Pinning to my Deliberate KIDS board. 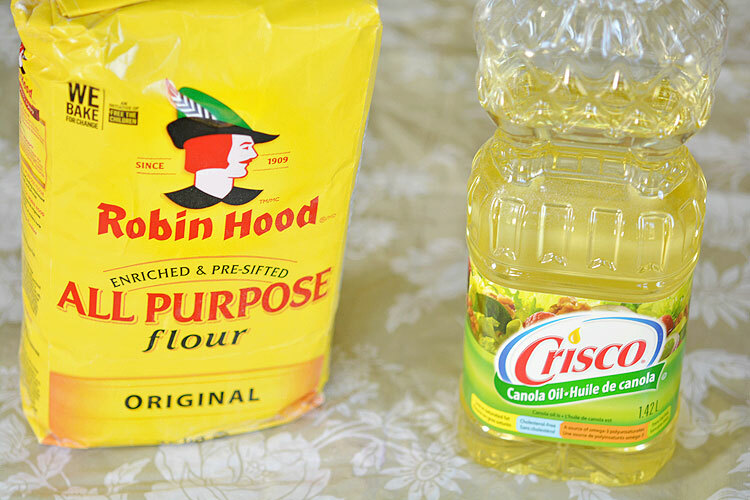 I’m wondering if you add some corn starch to the flour oil recipe if it will mold slightly better. Kind of combine the 2 recipes? What do you recommend on that? Wonder if I can add food coloring and glitter to this? I want it to be galaxy colors with glitter in it for my daughter’s space-themed birthday! The kids loved it . It’s a bit messy but it’s sand nonetheless it was super easy to make , cheap and fun. Sort of felt like a beach day . We did sand then the water table . The water washed away the sand and it’s not bad for the grass. It molded together but was super easy to break apart . 2 yr old and 9 year old approved .